The training of women in the maintenance of hand-pumps has not only flooded them with confidence, it has rescued a government water supply programme from sinking. "WE'VE BEEN repairing this pump since November 1989," says Ajufa Begum, a 27-year-old handpump mechanic in village Hathkhoapara in Assam's Kamrup district. "It has broken down 10 times in the past few years, but now we can handle it confidently." She is one of the five women who are proudly brandishing certificates establishing their credentials as "handpump mechanics", given to them after a one-day training course organised by the Public Health Engineering Department (PHED). A small, predominantly Muslim village, Hathkhoapara, 20 km off Guwahati, is part of a unique programme run by the UN Children's Fund (UNICEF): women have been trained to maintain pumps in Andhra Pradesh, Maharashtra, Madhya Pradesh, Uttar Pradesh, West Bengal, Rajasthan and Assam. For the purposes of this programme, Hathkhoapara is virtually UNICEF's model Indian village, one that has problems that can be solved: the village has two wells which go predictably dry in summer; it also has 10 shallow wells which are used for irrigation. In the 15 districts in the country where UNICEF is active, 2.2 million handpumps have been installed. Of the 1,000 mechanics trained to maintain the pumps, 448 are women. One among them, Lakshmibai of Akkanpally village in the Rangareddy district of Andhra Pradesh is elated. "Before I became a mechanic, the buffalo in the house got more care and attention than I ever did. Despite the resistance, going out has helped me. I meet so many different kinds of people from other villages -- my colleagues from different places as well as government officials. There is a camaraderie amongst us mechanics. We try to solve each other's problems. At last, I feel life is worth living." When the government started the programme the early 1970s, the focus was on safe drinking water, health and hygiene. A decade later, most of the handpumps were abandoned wrecks and the filthy surroundings mocked the programme's intention. UNICEF stepped in at this juncture as the supporting agency with funds from the Swedish International Development Agency (SIDA). Choppy start When it began training women in 1988, it hit the choppy waters of established convention. "A woman mechanic repairing a pump would have drawn hordes of jeering villagers," says octogenarian Tarapada Manna of Gopalpur village in West Bengal's Medinipur district. Over the years, perceptions changed and forced the men to button the scoffing and lend a hand. UNICEF's modus operandi differed from place to place. In West Bengal, UNICEF works in collaboration with the Ramakrishna Lok Shiksha Parishad, a non-governmental organisation. In Uttar Pradesh, water is the responsibility of the Jal Nigam, a statutory body. In Andhra Pradesh, the maintenance of rural handpumps is the Panchayati Raj Engineering Department's responsibility. The smart tactic was roping in women, a gender trial first experimented with in 1988 in Rajasthan's Banswara district. Banswara, and the neighbouring districts of Udaipur and Dungarpur, had endemic guineaworm problems. To eradicate the disease, Safe Water and Community Health (SWACH) was formed the same year. Stepwells were either discarded or converted into draw-wells and India Mark II pumps were installed. It was only when the safe water outreach programme involving handpumps made an impact in the villages that agencies like SWACH, PHED and UNICEF realised that maintenance was an overwhelming problem. This is where women came in. "Procuring drinking water for the household is considered a woman's problem," says Rehaman Khan, a fitter in the block development office in the Udaipur district's Borikuan village. "When a handpump breaks down, it is the women who suffer. Because of communication problems, the distance and the inaccessible terrain, it sometimes used to take mechanics from the (block) headquarters months to repair a handpump. 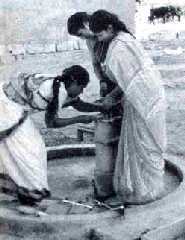 Now the pumps are repaired instantly because the women know that otherwise they will have to walk miles to get water." There is a loose system of rewards: in the Medinipur district in West Bengal, for instance, any village which establishes 40 septic latrines, collects Rs 500 for the construction of a handpump, and wheedles 50 paise per family for its maintenance is given a handpump. Under the aegis of the Ramakrishna Mission Lok Shiksha Parishad, Medinipur's 544 youth clubs have been active in creating awareness and motivating villagers about safe drinking water and septic latrines. Awareness slogans, for instance, says Shiuli, a class IX student in Medinipur district's Satmaile village, include, "Je barite kahta paikhana, she barite biye na" (No marrying into the house that has a service latrine). Shiuli's grouse is that she can't, for the moment, be a mechanic: a precondition here is that they have to be married. "This precludes the hassle of training women from scratch once a girl gets married and leaves the village," says Jayanta Roy, a UNICEF official in Calcutta. But in Medinipur, the availability of water is not an overwhelming problem. Potability is. The district lies in the diarrhoeal belt of the state. Following a disastrous epidemic in 1989, the state government was forced to prioritise diarrhoea control through projects emphasising personal hygiene, safe drinking water and oral rehydration therapy. Each area in India has its own distinctive problem. Who can solve it better than women? For most women involved, the job is a labour of love leavened with hardnosed pragmatism. While in Assam and West Bengal, women are motivated enough to render free service, their counterparts in Rajasthan are paid Rs 11 per month for each handpump under their care, and in Uttar Pradesh, a rupee less. Says a UNICEF official, "Whether the women are going to be paid and, if the answer is affirmative, how much, is decided and executed by the Jal Nigam or the PHED and other collaborating bodies." But "training women to be just mechanics is not really empowering them," says Renu Gare, a UNICEF project officer in Delhi. "It is only a very miniscule step towards making the women self-reliant. Women are not really in power unless they can make decisions and educate and motivate others to carry them out." Mega-projects are in the pipeline to involve more women in village contact drives and water and sanitation (WATSAN) committees. Consumer-based convergence services (CBCS) have been formed encompassing literacy, health, hygiene, nutrition -- in fact, anything that directly concerns women. Handpump mechanics is just a beginning, a milestone on the road to emancipation.